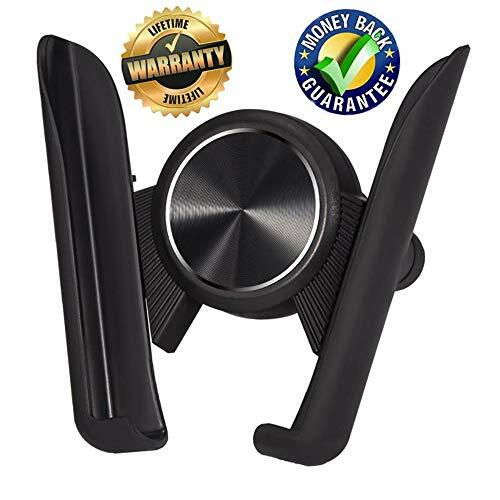 HapGo Cell Phone Holder for car,Adjustable GPS Holder for Dashboard and Air Vent Universal Car. WHY THE HP08 IS THE BETTER CHOICE IN CAR PHONE ACCESSORIES? 1. Confidently go hands-free with your phone using this convenient clip-on phone mount. 2. Easy to use, simply slide in your phone and the mount holds tight. No fumbling around! 3. One hand is all you need to drop the phone in or remove it easily. 4. Works with most smart phones Android or iOS, regardless of size or shape, and holds tight under normal driving conditions. 5. Phone mount keeps your phone in place even over speed bumps, train tracks, or potholes! 7.Don't settle for stashing your phone wherever you can when you can place your phone in a desired location using this clip mount. 8. Designed without magnets: No harm to your device battery. 9.No need to stick extra metal plate on the back of your phone, no need to worry about your phone falling off the holder when the magnet becomes weakening. Customers Trust the HapGo Brand which Supply the highest Quality Products and Fanatical Customer Support.